If it glows like, works like, and even dims like an incandescent, it must be an incandescent bulb, right? Wrong. The 8W Philips EnduraLED only draws a fifth of the power to produce the same warm illumination as the filament bulbs you've already got. The light bulb that just eliminated your last excuse to keep using incandescents—the cost of LEDs. People that want 40W of light for 8W of electricity. 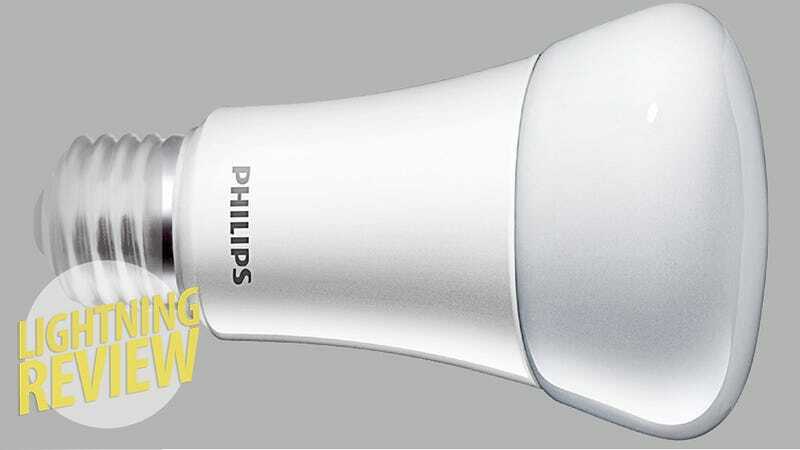 It looks nearly identical to Philips' Hue bulbs, with a majority of the bulb body taken up by the electronics with a little illuminating mushroom cap on top. It uses a standard A19 bulb base so it should fit in all of your overhead lights with minimal issue. The EnduraLED behaves exactly like a conventional incandescent, turning on and off instantly. Plus, it dims without stuttering, flickering, or that annoying humming that filament bulbs sometimes produces. It provides bright, clean light without throwing deep shadows. These things are surprisingly resilient. I dropped one from ceiling height, bounced it off a step stool onto hardwood and it was none the worse for wear. Dimming feature requires leading or trailing edge dimmer switch. Does not discharge UV or IR light, which fades fabrics and interferes with remote controls. Yes, especially with the upcoming phase out of incandescent bulbs thanks to the passage of the Energy Independence and Security Act of 2007. Plus, they produce a great amount and quality of light for minimal annualized cost given they only run about $24 apiece.